"Parkers has carried out various repairs, service and MOT over the last 12 months and the service has always been excellent, the charges always perfectly reasonable -thoroughly recommend." "Long well established business, great bunch of people pleasure to do business with, keep up the great work." 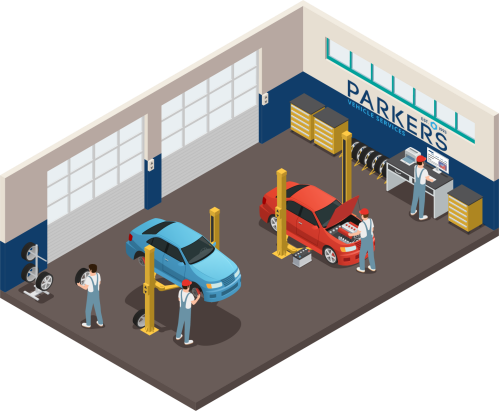 Parker's Vehicle Services has been established in Bognor Regis for over twenty years. We are a friendly and reliable independent MOT, service and repair centre, working on all makes of petrol and diesel cars, vans and light commercial vehicles. We can carry out MOT’s on all makes of Class 4, Class 5 and Class 7 vehicles including motorhomes, campervans and minibuses. At Parker's Vehicle Services we pride ourselves on delivering a 5 star service. If there is anything you don't understand, we will go above and beyond to explain. If you need a lift home, we will ensure this is done. If you need to borrow one of our courtesy cars, just let us know in advance and we will try our best to make sure one is available. If you would like to wait while your vehicle is being worked on - our friendly team make a great cup of tea! And lastly we will look after your vehicle as if it was one of our own. It has never been considered by us to be too much trouble or an inconvenience to us should any customer, new or old, just pop in to speak with one of our members of staff and discuss any problems or concerns they may be experiencing with their motor vehicles. After checking our services on the website, if you are looking for more information on Parker's Vehicle Services wide range of services or have a question about your car, give us a call on 01243 841969.